In the early 1970's, video arcade games gained commercial success for the first time. The American public was introduced to Pong, Tank, and other interactive video games which populated amusement parks, bars, and arcades. The games were successful enough to create interest for home versions, so in 1975 Atari released Home Pong and it was a smash hit. Other companies such as Magnavox and Coleco followed suit and released their own dedicated console games. Then in 1976, Fairchild Camera and Instrument introduced the Channel F system, the first cartridge based home video game system. The industry recognized that cartridge systems were the future of video gaming, and began development in that direction. In January 1977, RCA released the Studio II, another cartridge based system, although it only projected in black and white and seemed to be focused on educational titles. 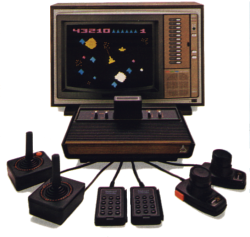 Then, in October 1977, Atari released the Atari VCS (Video Computer System) with an initial offering of nine games. This system, later renamed the Atari 2600, took the industry by storm and dominated the marketplace for years to come. Because of oversupply, the Christmas season of 1977 was very rough on the video game industry, and the Atari 2600 was the only system that managed to emerge unscathed. Atari enjoyed strong sales in 1978 and a fantastic holiday season, as Atari released more games such as Outlaw, Spacewar, and Breakout. Internally however, Atari was at odds. 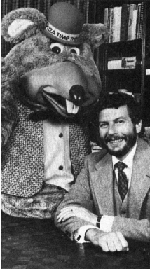 Nolan Bushnell, the inventor of pong and founder of Atari, wound up leaving the company and purchased Pizza Time Theater, which later became the successful Chuck E. Cheese! In 1979 Atari continued their trend and released 12 more games which met with continued success. However, Atari was now facing some stiffer competition from the Mattel Intellivision and the Magnavox Odyssey2. Atari needed a mega-hit in 1980 in order to squash the competition, and they found it in the home version of a game from Japan called Space Invaders. 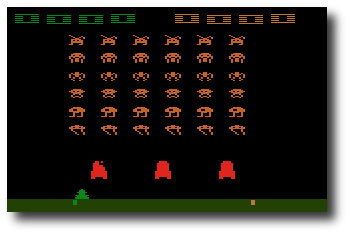 It was so popular that people were buying the Atari 2600 just so they could play Space Invaders at home. 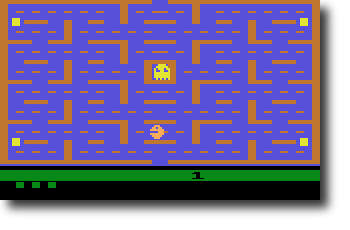 Following that, Atari released Adventure, which was the first video game to contain an Easter Egg - placing an object in a certain area revealed the programmer's name, Warren Robinett. 1980 was important for another reason - the creation of the first ever third party software producer, Activision. The company was formed by four Atari employees who were unsatisfied with the working conditions at the company. They released four games initially: Dragster, Fishing Derby, Checkers and Boxing. The games were very well received by the public, and revealed that the Atari 2600 was capable of better games than Atari themselves had been producing. Atari tried to prevent Activision from selling games, but they failed and Activision grossed $70 million that year. 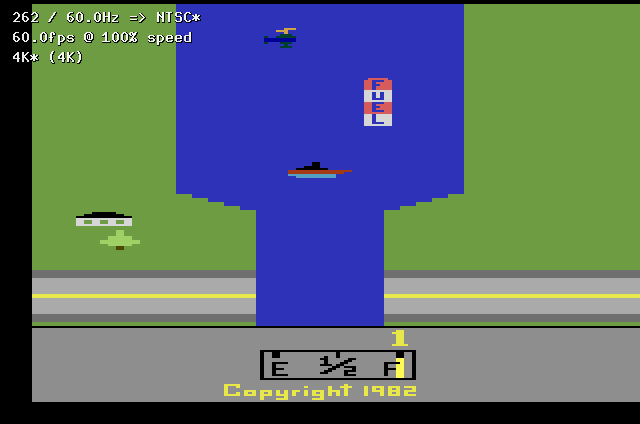 By 1981, the video game industry was basically a horse race between the 2600 and the Intellivision. While the Intellivision was technologically superior in some respects, the 2600 continued to lead in sales. Atari released the home version of Asteroids, which was a huge success. Inspired by the success of Activision, another software development group called Imagic was formed. They would not release any games until 1982 however. Another company, Games by Apollo, was formed in Texas and released several games that year. Coleco entered the market in 1982 with the release of the graphically superior Colecovision. To combat this new system, Atari produced the 5200, a technologically comparable system. The 2600 dropped $100 in price in order to remain competitive. Then a company called Arcadia released a peripheral called the Supercharger which played games in an audio cassette medium. This allowed for multiple loads and expanded the 2600's capabilities. Atari released Pac-Man and E.T. that year, two incredibly hyped games which were critical flops. Although Pac-Man sold many copies, it was considered to be a poor translation of the arcade hit. However, there were many fantastic games produced for the 2600 during this period, and it was still selling strong. Ever since the inception of Activision, Atari had been fighting to keep third parties from producing cartridges which they felt were stealing profits from them. Finally the issue was settled when Atari agreed to allow third party manufacturing in exchange for a royalty. Suddenly software companies began popping up all over, and 1982 saw releases from companies like Venturevision, Spectravision, Telesys, CBS, 20th Century Fox, US Games, M Network, Tigervision, Data Age, Imagic and Coleco. There was even a company that released a line of X-Rated games for the 2600 called Mystique. The year was financially successful for Atari, however there seemed to be a glut of software. Although there were many quality titles still produced, there was an increasing number of rushed games as manufacturers attempted to cash in on the craze. More companies jumped on the band wagon in 1983. Zimag, Ultravision, Amiga, and others were also producing games and peripherals. It seemed as if there was just too much product to meet the demand, and as it turned out there was. By the end of the year, companies began folding. US Games, Data Age, Games by Apollo, Telesys and others all closed their doors from poor sales. A video game crash was occurring, and all companies were taking it on the chin. 1984 was a much more subdued year for the Atari 2600, and the price of the system had now dropped to $40-$50. Many were saying that the video game industry was dead. However, Atari surprised everyone by announcing the release of the 7800, and also promising more 2600 games with improved graphics and sound. Unfortunately, neither of these things happened in 1984 because Atari sold their home video game division to Jack Tramiel who believed that home computers would replace video game systems. No further mention of the 2600 or 7800 was made that year, and it appeared that they might be dead. 1985 was another very quiet year for Atari and video games in general, and only a few games were released for the 2600. Activision produced Cosmic Commuter and Ghostbusters, but with little fanfare or marketing, these games did not sell well. However, because of the huge game library and cheap price, Atari still sold over a million 2600 consoles in 1985. There were very few plans for home video game systems by any company in 1986, since the market appeared to be dead. Then, to most people's surprise, Nintendo brought the NES to America and it was a smash hit, proving that video games still had a place in the US. Atari decided that maybe it would be a good idea to release the 7800 units it had in storage, and produce some more 2600 games. The 7800 was released with only 3 games initially available, although it was compatible with the 2600 library. They also redesigned the 2600 as the 2600 Jr., a machine with the same abilities, but a new look and marketing campaign. It was sold for less than $50. Video games were once again selling phenomenally in 1987. 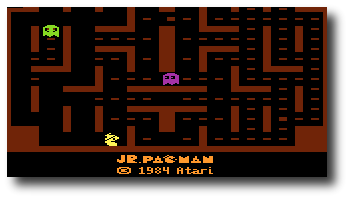 Atari released several new titles, including Jr. Pac-Man, and also licensed a number of games from other companies such as Donkey Kong and Q*Bert. These new titles sold for $10-$15. Interestingly, a number of titles began appearing again from third part companies such as Epyx, Froggo, and Exus. It seemed that the 2600 was not dead yet! 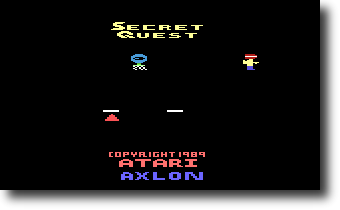 In 1988, Atari rehired Nolan Bushnell and announced a number of new titles, including Secret Quest, a game written by Mr. Bushnell himself. Atari continued to manufacture these games even until 1989. However, it was apparent that the 2600, after its introduction over a decade ago, was finally at the end of its run. Although it was still produced and marketed outside of the US, the Atari 2600 finished its run in America. No other console has had such a long history or sold as many systems in the U.S.
Today, the 2600 still has a large number of fans who remember the countless games played over the years, and the years to come. There are even games being produced by hobbyists, some of them quite professionally, being released on newly burnt cartridges with labels and manuals. And the recent trend in retrogaming has brought many more video game fans to rediscover the 2600, and it continues to live on 22 years after its release! 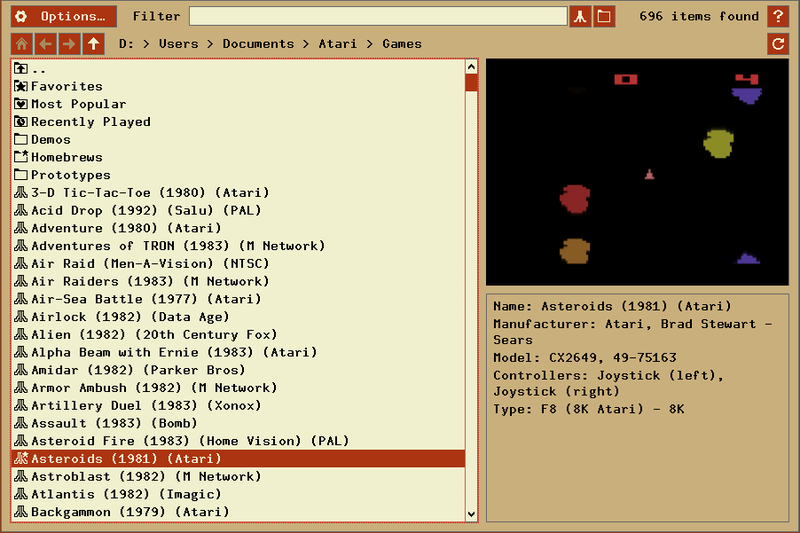 Stella is a freely distributed multi-platform Atari 2600 VCS emulator; originally developed for Linux by Bradford W. Mott, it is now maintained by Stephen Anthony. Stella allows you to enjoy all of your favorite 2600 games once again by emulating the 2600's hardware with software. Stella is written in C++, which allows it to be ported to other operating systems and architectures. Since its original release Stella has been ported to AcornOS, AmigaOS, DOS, FreeBSD, Linux, MacOS, OpenStep, OS/2, Unix, and Windows, as well as consoles such as Sega Dreamcast, GP2X, Nintendo DS and Playstation Portable (among others). Emulation of CRT TV systems using Blargg filtering, including presets for several common TV outputs (composite, S-video, RGB, etc. ), and ability to fully customize many attributes (contrast, brightness, saturation, gamma, etc.). The following sections outline the basic system requirements for running Stella under various operating systems. Stella is extremely portable, and in its lifetime has been ported to almost every platform where the SDL library exists. It is 32/64-bit and endian clean in Linux/Unix, macOS and Windows. The Stella Team is interested in hearing about any problems you may encounter with diverse operating systems and CPU types. Stella is distributed in both source and binary form. In general, you should always download and install the appropriate binary version. Compiling from source is only recommended for developers, or if the binary version doesn't work for some reason. Once you have a Stella distribution you should follow the instructions for your operating system given below. See the developers build instructions at the Stella Development Page. Double-click the disk image, open the 'Stella' folder, then copy the Stella.app package to your 'Applications' folder. Most games for the Atari 2600 came on cartridges. A cartridge usually consists of a single Read Only Memory (ROM) chip which contains the data and code for the game. Plugging a cartridge into the Atari 2600 allows the 2600's microprocessor to access the program stored on the cartridge. Search around the internet and find ROM images to download (websites such as AtariAge and AtariMania/RomHunter may be useful). Many homebrewers make their ROMs available too. WARNING: It may be illegal to use ROM images of games that you do not actually own since these games may still be copyrighted. Supercharger games were not stored on cartridges instead they were stored on cassette tapes. The Supercharger, which plugged into the Atari 2600's cartridge slot, loaded games into its 6K of Random Access Memory (RAM) using a standard audio cassette player. The Supercharger also supported multi-loading, which allowed games to be broken into several segments and loaded at different times. This was useful for large games which had distinct parts such as role playing games. Most of the available Supercharger ROM images are stored in 8448 bytes files. However, ROM images of multi-load games are sometimes stored in a set of 8448 byte files. The names of these files have a two character sequence number in them which indicates what load they are. The sequence starts with zero, skips a few numbers and then increments by one. Once you have the multi-load ROM image file, survivl.bin in this case, you can play the game using it. Stella supports ROMs ending with extensions .a26, .bin, .rom, .gz, and .zip. For the last two compressed formats (GZIP and ZIP, respectively), Stella will automatically decompress the archive, and use the first ROM image it finds in it (ie, the first one ending in a valid extension). If a ZIP archive contains many such files, Stella will display a virtual filesystem of the contents of the archive. Other extensions are also possible, namely to force a specific bankswitch scheme. Normally, the bankswitching scheme for a ROM is determined automatically, or manually by setting a ROM property, and you never have to do anything yourself. However, it is also possible to force the bankswitch type to use by adding a special filename extension. These extensions are listed in the ROM properties section under Cartridge.Type -> File Extension. Note: These extensions are the same as those used by the Harmony Cart and Unocart and are not case-sensitive, so you can name your files and have them work across all applications. Again, to be clear, this is only necessary when you want to override the default bankswitching scheme for a ROM. This will not normally be necessary. Once Stella is installed and you have some ROM images you're almost ready to start playing. 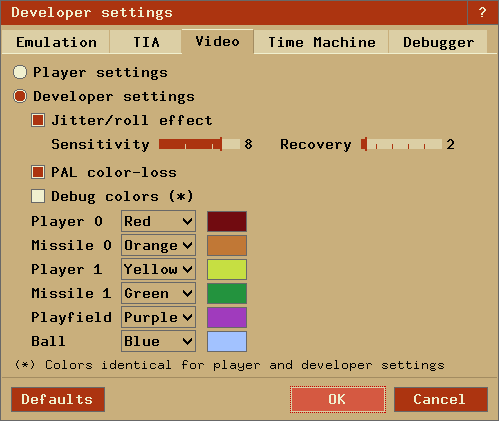 Stella contains an integrated GUI for all ports. Commandline support is also available for those who want to use it. If this is your first time starting Stella, you may have to navigate to your ROMs. 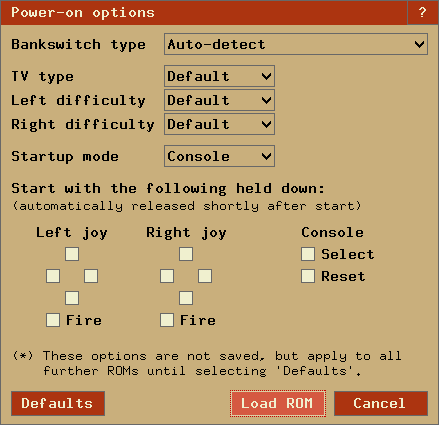 The path of the first ROM you play automatically defines the default ROM path. You can change it later in the Configure Paths dialog. At this point, you may want to set the locations for snapshots and other external paths. This is described in more detail in Advanced Configuration - Snapshot Settings and Advanced Configuration - Configure Paths. These settings are optional, and can be left at the defaults if you won't be using snapshots in the ROM launcher. 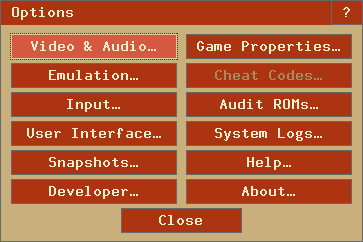 you can start emulation by selecting a ROM and pressing 'Enter' or clicking 'Select', or double-clicking a ROM. Note that some games require you to 'Reset' the console before you start playing. In this case, you need to hit the virtual reset switch, which by default is the F2 key. Also, some games may require that you press the joystick fire button to begin, which by default is the Left Control or Space key(s), or button 0 on your joystick. If a game uses a more complex controller, see Getting Started - Keyboard Layout for more information. To exit a game and re-enter the ROM launcher, press the 'Escape' key. 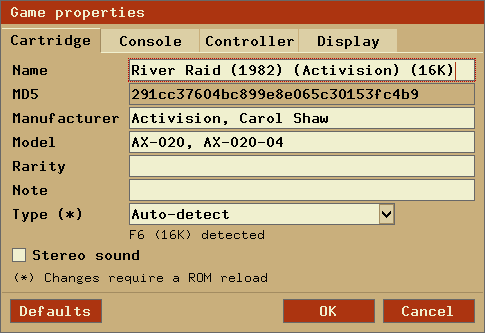 Using the 'Search' textbox in the upper-right of the ROM launcher, the listing can be narrowed down, showing only the ROMs that match the pattern you enter. This dialog contains a set of buttons that represent the same functionality as the function keys. You may find this useful if you cannot remember all the function key events, or you wish to use Stella without a keyboard (ie, in a standalone gaming system). 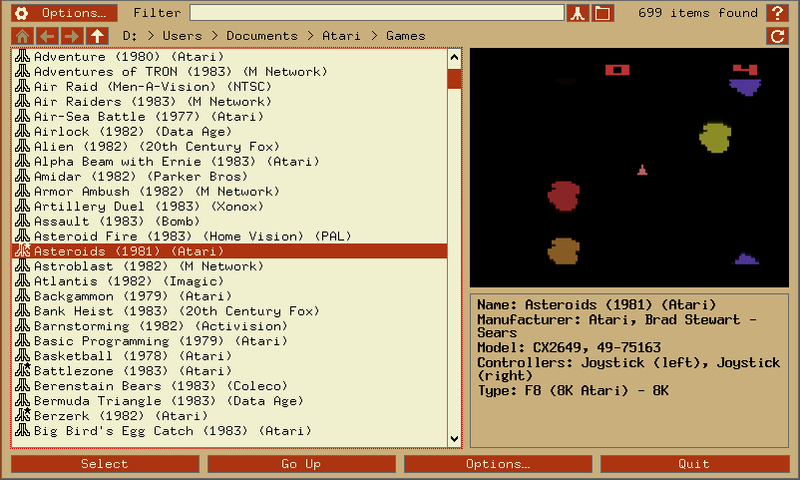 The Atari 2600 console controls and controllers are mapped to the computer's keyboard as shown in the following tables. However, most of these events can be remapped to other keys on your keyboard or buttons on your joystick (see Advanced Configuration - Event Remapping). The tables below show the default settings. Note: All key names are based on the US QWERTY keyboard layout.. If you use a different layout some keys may differ. You can use the following layout image as reference where to find the US keys on your keyboard. Toggle all TIA objects Alt + . Cmd + . Toggle all TIA collisions Shift-Alt + . Shift-Cmd + . 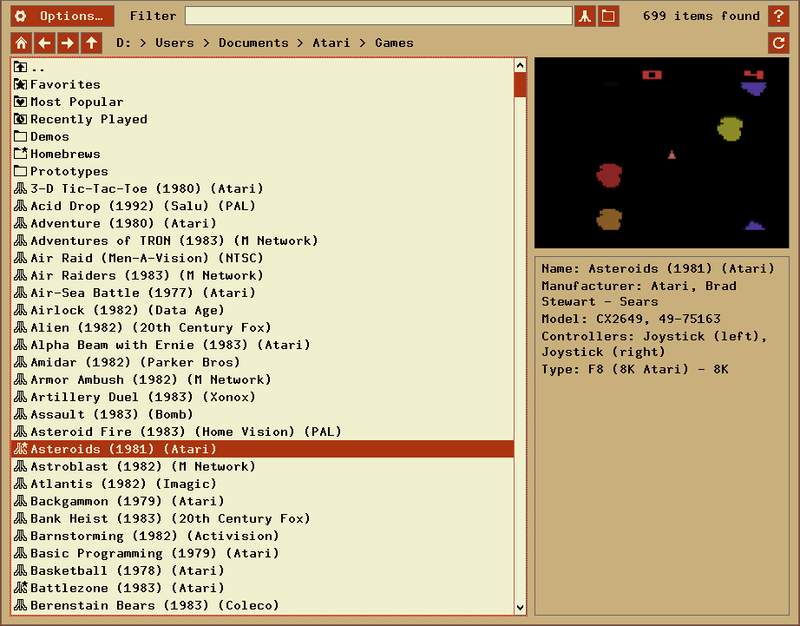 Some Atari (virtual) controllers are simulated with more than one computer controller, and there are several special cases where controllers are active in certain modes only, as the table below shows. Items marked as (+ extra) indicate that the computer controller may not have enough buttons/axes etc. to fully emulate the device, so extra functionality must be mapped to other controllers. A special feature of Stella is the 'Time Machine' mode. In this mode, Stella automatically creates savestates in regular, user-defined intervals. At any time, the user can interrupt the current emulation and navigate back and forth within the saved timeline. This can be done either by using the Time Machine hotkeys described in Hotkeys - Other Keys or by using the Time Machine dialog. This dialog is automatically entered when using one of the Time Machine hotkeys. The hotkeys continue to function within the dialog. The dialog items are explained in the following two tables. 'Timeline' slider Shows the position of the current state in the recorded timeline. A state can be selected by dragging the slider with the mouse. To visualize state compression, small marks split the timeline into five, equally sized state number intervals. Navigation info Informs about the interval of the user's last Time Machine navigation. The interval can vary if the timeline is compressed. The default options in Stella are meant to cater to as many situations as possible. As such, you may never need to change many of its options. However, Stella is very configurable, and if you want to change its behaviour in some way, there's likely a configuration option to do so. The remainder of this (lengthy) section details every configurable option. In addition to the built in ROM launcher, Stella can also be used from the commandline (assuming your operating system has a commandline). Use the given rendering backend (where applicable); default is the best available mode detected. Synchronize screen updates to the vertical blank period. This can result in smoother updates, and eliminate tearing. Centers game window (if possible). Set the palette to either normal Stella, the one used in the z26 emulator, or a user-defined palette. Control the emulation speed (as a percentage, 10 - 1000). Enable or disable display of message in the UI. Note that messages indicating serious errors override this setting, and are always shown. Enable or disable sound generation. Specify the sound fragment size to use. Linux/Mac seems to work with 512, Windows usually needs 1024. Set sound sample output frequency (11025, 22050, 31400, 44100, 48000) Default is 31400. Do not change unless you experience sound issues. Set the volume (0 - 100). Use the specified zoom level (integer) while in TIA/emulation mode. Use interpolation for the TIA image (results in blending/smoothing of the image). 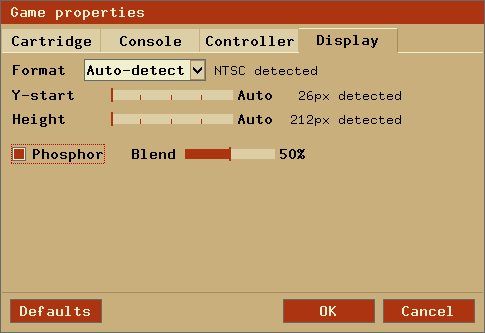 Specify the amount (as a percentage) to scale the TIA image width in NTSC and PAL mode. Since many video modes do not use square pixels, you can reduce width until the pixels appear square. Allowable values are 80 - 120; I find 85 - 90 gives the most authentic look for NTSC, and 105 - 110 for PAL. Stretch TIA image completely while in fullscreen mode (vs. an integral stretch which won't necessarily completely fill the screen). Assigns the colours (R)ed, (O)range, (Y)ellow, (G)reen, (B)lue and (P)urple to each graphical register P0/M0/P1/M1/PF/BL, respectively. Currently, these change be changed around to apply different colours to the respective register. 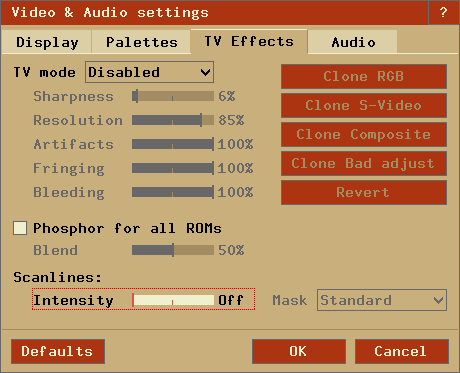 Blargg TV effects, 0 is disabled, next numbers in sequence represent presets for 'Composite', 'S-Video', 'RGB', 'Bad Adjust', and 'Custom' modes. Determines how phosphor mode is enabled. If 'always', then the ROM properties entry is ignored, and phosphor mode is always turned on. Otherwise, the ROM properties determine whether phosphor mode is used for each ROM. Enable phosphor blending level; 0 implies no mixing, and 100 is full mixing (not recommended). Note that this doesn't actually enable phosphor mode; that is done for each ROM in the ROM properties. Higher blend values will intensify the phosphor effect. Depending on your display and personal preferences, the optimal default for you may vary. Slow LCDs (especially for office use) may only need a low blend of around 30, while fast switching gamer LCDs may need about 70 to look similar to a CRT. TV effects scanline intensity, where 0 means completely off. Note: No scanlines in 1x mode snapshots. Blargg TV effects scanline interpolation, resulting in blending/smoothing of the scanlines. Blargg TV effects 'contrast' (only available in custom mode, range -1.0 to 1.0). Blargg TV effects 'brightness' (only available in custom mode, range -1.0 to 1.0). Blargg TV effects 'hue' (only available in custom mode, range -1.0 to 1.0). Blargg TV effects 'saturation' (only available in custom mode, range -1.0 to 1.0). Blargg TV effects 'gamma' (only available in custom mode, range -1.0 to 1.0). Blargg TV effects 'sharpness' (only available in custom mode, range -1.0 to 1.0). Blargg TV effects 'resolution' (only available in custom mode, range -1.0 to 1.0). Blargg TV effects 'artifacts' (only available in custom mode, range -1.0 to 1.0). Blargg TV effects 'fringing' (only available in custom mode, range -1.0 to 1.0). Blargg TV effects 'bleed' (only available in custom mode, range -1.0 to 1.0). 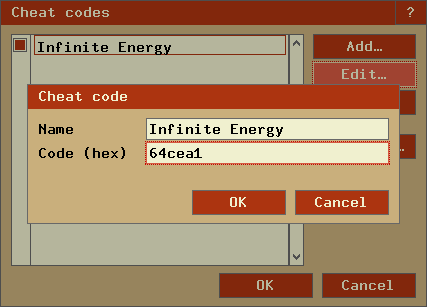 Use the specified cheatcode (see Cheat section for description). Indicates level of logging to perform while the application is running. Zero completely disables logging (except for serious errors), while the remaining numbers show increasingly more detail. Indicates that logged output should be printed to the console/commandline as it's being collected. An internal log will still be kept, and the amount of logging is still controlled by 'loglevel'. Sets the joystick axis deadzone area for joysticks/gamepads. All values within the deadzone are treated as zero-axis values, while only those values outside are registered as valid input. Accepts a number from 0 - 29, and uses the formula 3200 + number * 1000. So the possible deadzone values range from 3200 to 32200. Allow all 4 directions on a joystick to be pressed simultaneously. Use mouse as a controller as specified by ROM properties in specific case. Always and never are self-explanatory, analog means only for analog-type devices (paddles, trackball, etc.). Locks the mouse cursor in the game window in emulation mode. Set mouse cursor state in UI/emulation modes. Sensitivity for emulation of paddles when using a digital device (ie, joystick digital axis or button, keyboard key, etc.). Valid range of values is from 1 to 20, with larger numbers causing faster movement. Sensitivity for emulation of paddles when using a mouse. Valid range of values is from 1 to 20, with larger numbers causing faster movement. Sensitivity for emulation of trackball controllers when using a mouse. Valid range of values is from 1 to 20, with larger numbers causing faster movement. Determines how to enumerate the Stelladaptor/2600-daptor devices in the order they are found: 'lr' means first is left port, second is right port, 'rl' means the opposite. Use control-x key combos. This is normally enabled, since the 'Quit' command is tied to 'Control-q'. However, there are times when a 2-player game is using either the 'f' or 'r' keys for movement, and pressing Control (for Fire) will perform an unwanted action associated with Control-r or Control-f. Automatically switch to the next available save state slot after saving a ROM state file. Disable Supercharger BIOS progress loading bars. Enable multi-threaded video rendering (may not improve performance on all systems). The directory to save snapshot files to. The directory to load ROM info viewer snaposhot files from. When saving snapshots, use either the internal database name or the actual ROM filename. Generate single snapshot instead of many, overwriting any previous snapshots. Ignore any scaling applied to the TIA image, and save snapshot in unscaled (1x) mode. Set the interval in seconds between taking snapshots in continuous snapshot mode (currently 1 - 10). Display detailed information about the given ROM, and then exit Stella. Prints relevant contents of the Stella ROM database, one ROM per line, and then exit Stella. This can be used for external frontends. Always exit to ROM launcher when exiting a ROM (normally, an exit to launcher only happens when started with the launcher). Set the size of the ROM launcher. Set the size of the font in the ROM launcher. Specifies whether to show ROMs only (the default) or all files in the ROM launcher. Hide ROM Info Viewer in ROM launcher mode (0), or use the given zoom level (1 or 2). Use the specified palette for UI elements. Set the number of lines a mousewheel will scroll in the UI. Set the directory where the ROM launcher will start. Set the directory in which to access state files. Set the full pathname of the cheatfile database. Set the full pathname of the user-defined palette file. Set the full pathname of the ROM properties file. Set the directory in which to access non-volatile (flash/EEPROM) files. Set the directory in which to access Distella config files. Set the name of the serial port where an AtariVox is connected. Useful for developers, this sets the maximum size of window that can be created, allowing to simulate testing on 'smaller' systems. Prints a help message describing these options, and then exit Stella. The following are useful to developers. Only use them if you know what you're doing! Note that in all cases, the values supplied to the arguments are not case sensitive. Try to differentiate between code vs. data sections in the disassembler. See the Debugger - ROM Disassembly Settings for more information. Sets the base to use for displaying GFX sections in the disassembler. Shows/hides opcode addresses in the disassembler. Relocate calls out of address range in the disassembler. Set the size of the debugger window. Set the font size in the debugger window. How to use bold fonts in the debugger window. '0' means all normal font, '1' is bold labels only, '2' is bold non-labels only, '3' is all bold font. Set a breakpoint at specified address. Immediately jump to debugger mode when starting Stella. Start the emulator with the left joystick direction/button held down (ie, use 'UF' for up and fire). After entering the emulation, you will have to press and release the direction again to release the event. Start the emulator with the right joystick direction/button held down (ie, use 'UF' for up and fire). After entering the emulation, you will have to press and release the direction again to release the event. Start the emulator with the Game Select switch held down. After entering the emulation, you will have to press and release 'Select' to release the event. Start the emulator with the Game Reset switch held down. After entering the emulation, you will have to press and release 'Reset' to release the event. Set "Cartridge.Type" property. See the Game Properties section for valid types. Set "Controller.Left" property. See the Game Properties section for valid types. Set "Controller.Right" property. See the Game Properties section for valid types. Sets both "Controller.Left" and "Controller.Right" properties. See the Game Properties section for valid types. Set "Controller.MouseAxis" property. See the Game Properties section for valid types. Set "Display.Format" property. See the Game Properties section for valid formats. Set "Display.YStart" property (0 - 64). Set "Display.Height" property (210 - 256). Set "Display.PPBlend" property, used for phosphor effect (0-100). Default is whatever is specified for tv.phosblend. The following are available in two sets, one for players (prefixed by "plr.") and one for developers (prefixd by "dev."). Only use them if you know what you're doing! Note that in all cases, the values supplied to the arguments are not case sensitive. Select developer (1) or player (0) set. Overlay console info on the TIA image during emulation. Select console for B/W and Pause key handling and RAM initialization. On reset, randomize the startup bank (only for selected bankswitch types). On reset, either randomize all RAM content, or initialize with zero (console = 2600)/startup values (console = 7800) instead. On reset, randomize the content of the specified CPU registers. Set unused TIA pins to be randomly driven high or low on a read/peek. If disabled, use the last databus value for those pins instead. Since the 2600 has no dedicated R/W line, different addresses are used for RAM read or write access. If the code reads from such a write address, this causes an unwanted, semi-random write to that address. 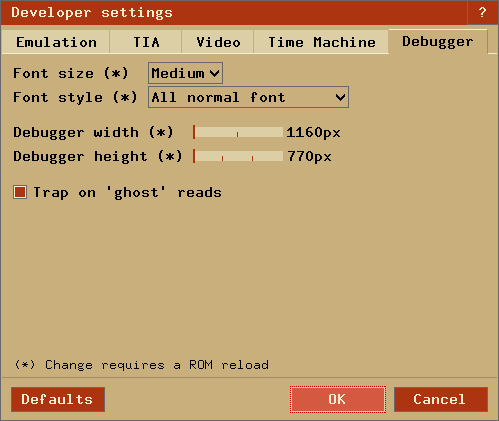 When this option is enabled, such reads interrupt emulation and the debugger is entered. When enabled, this allows the Thumb ARM emulation to throw an exception and enter the debugger on fatal errors. When disabled, such fatal errors are simply logged, and emulation continues. Do not use this unless you know exactly what you're doing, as it changes the behaviour as compared to real hardware. When enabled, each read or write access to the AtariVox/SaveKey EEPROM is signalled by a message. 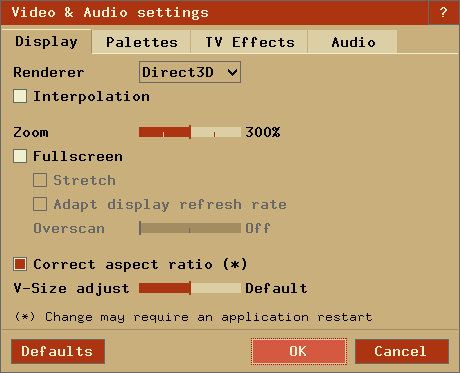 Enable TV jitter/roll effect, when there are too many or too few scanlines per frame. When TV jitter/roll effect is enabled, determines how long to delay recovery time (recovery spread over multiple frames). Enable/disable the PAL color-loss effect. Enable/disable the fixed debug colors. Defines the Time Machine buffer size. Defines the uncompressed Time Machine buffer size. Must be <= Time Machine buffer size. Defines the interval between two save states. Defines the horizon of the Time Machine. 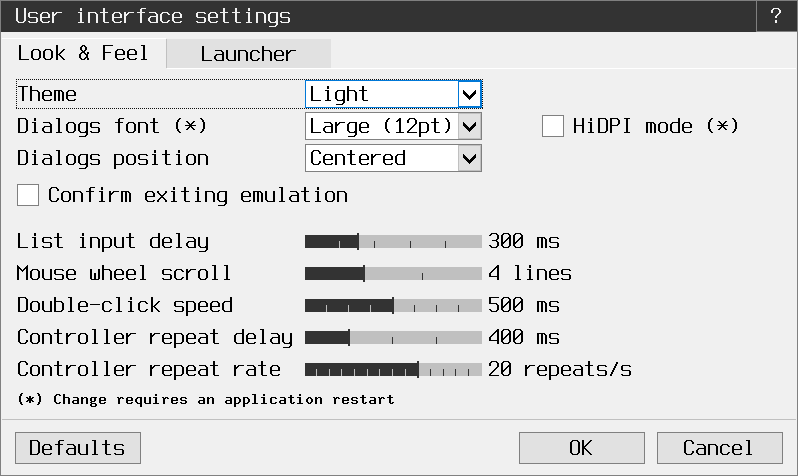 All settings can be changed within the integrated Options UI while Stella is running (unless otherwise noted; some settings require an application restart). The Options menu can be accessed from the ROM launcher by clicking the Options button, or in-game by pressing the 'Tab' key. Adjustable sliders Set specific attribute in 'Custom' TV mode -tv.contrast, -tv.hue, etc. Scanline intensity Sets scanline black-level intensity. IMPORTANT: In order to maintain a stable stream of audio data, emulation speed must be synchronized with the audio hardware. Buffering happens in multiple places (OS = fragment size, Stella = headroom and buffer size) and improves the tolerance to speed fluctuations, but introduces latency which manifests as a lag between audio and video. Too aggressive settings for your combination of hardware and software (high sample rate, low fragment size, low headroom, low buffer size) may lead to audio dropouts whose effect may range from isolated popping artifacts to garbled audio. You can check the system log for related messages. If you get recurring messages about audio overruns and underruns (isolates underruns / overruns are normal and a consequence of host system activity), you might have to adjust your settings. This dialog is described in further detail in Advanced Configuration - Event Remapping. This tab is described in further detail in Advanced Configuration - ROM Launcher. This tab is described in further detail in Advanced Configuration - Developer Options/Integrated Debugger. This dialog allows you to change all ROM properties as described in Advanced Configuration - Game Properties. This dialog is described in further detail in Advanced Configuration - ROM Audit Mode. Almost every event in Stella can be remapped to another key on the keyboard or to buttons on up to eight joysticks/gamepads (see Getting Started - Keyboard Layout for those events which can/cannot be remapped). 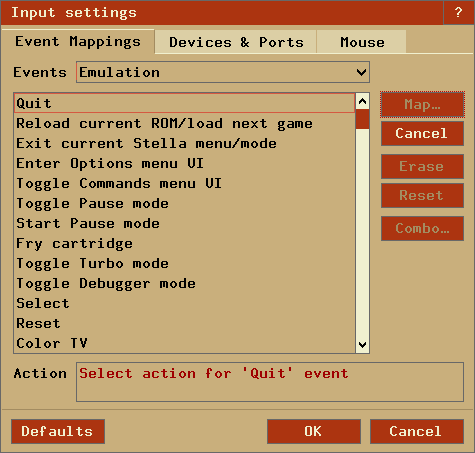 Note that there are currently two separate event modes in Stella; emulation mode and user-interface (UI) mode. 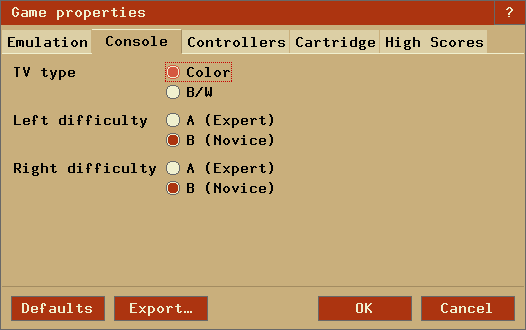 Each mode has separate mappings, so (for example) while in emulation mode, the left arrow could mean 'joystick 0 left', while in UI mode it could mean 'move cursor left'. Emulation mode occurs whenever you're actually playing a game. UI mode occurs whenever a user interface is present (ROM launcher, debugger, settings menu, etc.). Because of these different modes, there are two separate mapping areas. Enter Options Menu and click the Input Settings button. 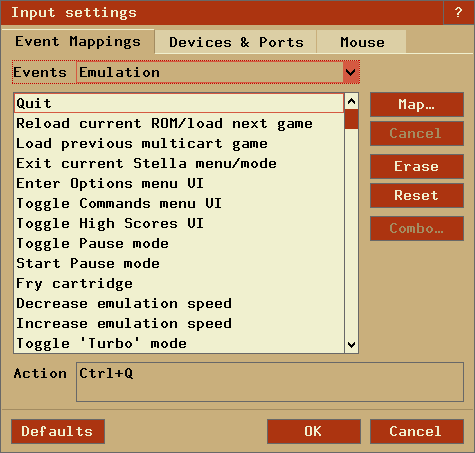 If you wish to remap emulation events, click the 'Emul. Events' tab. Otherwise, click the 'UI Events' tab for user interface events. Select event you want to remap and click the 'Map' button. Press a key or a joystick button, and that key/button will be bound to the selected event. If nothing seems to happen, either Stella can't see the input device, or the selected event doesn't support being remapped to the input device. Reset to default all mappings by clicking 'Defaults'. 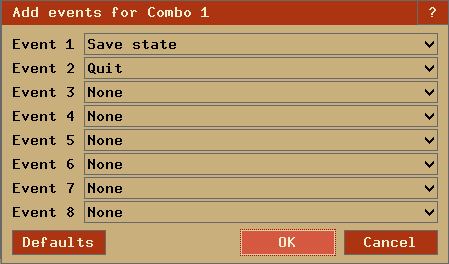 In this dialog, you can assign various events to the selected combo event. Note that this simply assigns multiple events to the combo; you still need to map the combo event itself to some action, as described in the 'remap an event' section above. Most of the options are self-explanatory, except for the 'ROM Info viewer', which is described below. Stella supports viewing snapshots and ROM properties of the currently selected ROM in the ROM launcher. Support is automatic, as long as your snapshot directory contains snapshots in the appropriate format. An archive of updated snapshots will be available on the Stella webpage. This archive may be updated periodically as new ROMs are found, and also for each new release of Stella. Note that the snapshots can be any size generated by Stella; they will be resized accordingly. The ROM Info Viewer can be shown in 1x or 2x mode only. To view snapshots in 1x mode, the ROM launcher window must be sized at least 640x480. If the launcher isn't large enough, the functionality will be disabled. To view snapshots in 2x mode, the ROM launcher window must be sized at least 1000x760. 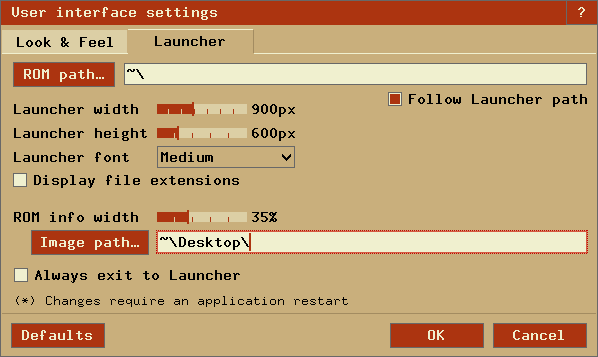 If the launcher isn't large enough, an attempt will be made to use 1x mode. The text box in the upper right corner can be used to narrow down the results in the ROM listing. When this box is empty, all files are shown (subject to the restrictions from the filtering option, explained below). Typing characters here will show only those files that match that pattern. For example, typing 'Activision' will show only files that contain the word 'Activision' in their name. This is very useful for quickly finding a group of related ROMs. Note that the search is not case sensitive, so you don't need to worry about capital or lower-case letters. Show only ROM files: Selecting this reloads the current listing, showing only files that have a valid ROM extension. Show all files: Selecting this reloads the current listing, showing all files (with no restriction on file name). Reload listing: Selecting this performs a reload of the current listing. It is an alternative to pressing the Control-r key combo. Stella has the ability to rename all your ROMs according to the name specified in the properties database. This is useful if you've downloaded ROMs in DOS 8.3 naming format, and wish the filenames to be more descriptive, or the current filenames are too large to see in the launcher. Simply select the ROM path with the 'Audit path' button, and click the 'Audit' button. The ROMs will then be renamed according to their internal properties. When the operation is complete, the number of ROMs that were renamed (as well as ones that weren't) will be shown. THIS OPERATION CANNOT BE UNDONE. I cannot stress this enough; if you aren't completely sure you want to rename your ROMs, don't use this function. There is no undo feature, and one won't be added. Only filenames that Stella considers to be valid ROMs will be considered. Currently, this means files with extensions described in "Supported File formats". Files which don't have these extensions will be ignored. If a valid ROM doesn't have a properties entry, it will be ignored. Stella supports real Atari 2600 joysticks, paddles, driving controllers and trackballs (CX22/CX80 'Trak-Ball', Atari and Amiga mouse) using the Stelladaptor and 2600-daptor devices. Stella can use up to two adaptors; any extra ones are ignored. Stelladaptor devices will be automatically detected and configured. The actual controllers can be plugged/unplugged while the emulator is running, although you will need to restart the game currently being emulated. The first device found will act as the left game port on a real Atari. Depending on the device, Stella will detect it as either the left joystick, paddles 0 & 1, the left driving controller, left keypad, etc. The second device found will act as the right game port on a real Atari. Depending on the device, Stella will detect it as either the right joystick, paddles 2 & 3, the right driving controller, right keypad, etc. Any other devices will be ignored. The assignment ordering of Stelladaptor/2600-daptor to port can be redefined with 'saport' (see description in Using the Command Line) and dynamically with the 'Control-1' key combo. Stella supports a real AtariVox device for the speech/SpeakJet portion of the controller. You will need a real AtariVox device as well as some means of connecting it to your computer (some sort of serial port/USB adaptor). There should be drivers for your serial convertor, which allow your particular operating system to 'see' the device (configuring this is outside the scope of this document). Once your operating system properly detects the AtariVox, you will need to tell Stella which serial port it is connected to. This is done by using the '-avoxport' commandline argument, or by setting it in the UI under the 'Devices & Ports' tab in Advanced Configuration - Input Devices. Note that you must use the entire name of the port as specified by your operating system. For example, in Windows this would be COM1, COM2, etc. ; Linux and macOS tend to use names similar to '/dev/xxxxxx'. For now, only Linux/UNIX, macOS, and Windows are supported. 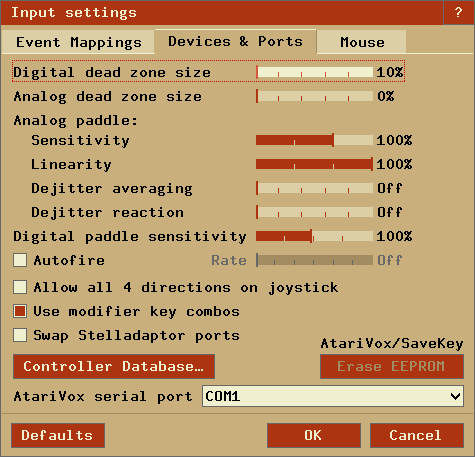 Support for the EEPROM portion of the AtariVox and SaveKey is currently emulated. That is, a file will be created on your computer simulating the EEPROM; the actual EEPROM hardware itself will not be accessed or modified. This is very useful in the testing stages of creating a new game, since writing to a real EEPROM many times will eventually wear it out. Note that these EEPROM files will be created when necessary, and initialized as a real EEPROM would be (containing all $FF). The files can be manually deleted, which is very useful in testing cases where a ROM is accessing the EEPROM for the first time. You can also reset the EEPROM to a clean state. Several developer related options can be configured in the 'Developer Settings' dialog. 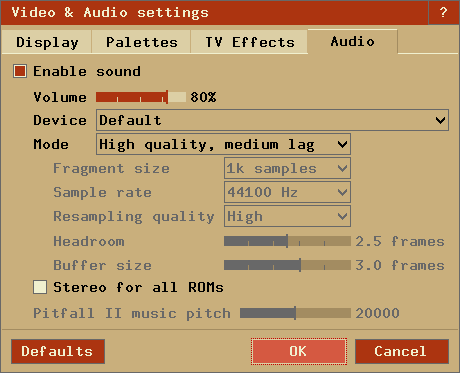 Two sets ('Player settings', 'Developer settings') allow easy adjustment of all settings for different use cases (playing or developing games) at once. Time Machine When the Time Machine is enabled, Stella will automatically buffer save states in the interval described below. The user can then navigate back and forth within the recorded timeline. Horizon Defines the horizon of the Time Machine. A large horizon allows going back further in time. To reach the horizon, save states will be compressed (*). This means that more and more intermediate states will be removed and the interval between save states becomes larger the further they are back in time. Developer key-combo shortcuts, used to change TIA state dynamically (ie, while the emulation is still running). See Keyboard Layout - Developer Keys in TIA mode for more information. Commandline options influencing emulation state. See Using the Command Line - Developer Commands for more information. Number of scanlines in current frame, associated framerate, and resulting display format. Note that the framerate shown is the internal, virtual framerate (it's calculated from the number of scanlines). If the '*' character is present, it means the display format was auto-detected as shown. For the given example, the format was auto-detected as 'NTSC'. 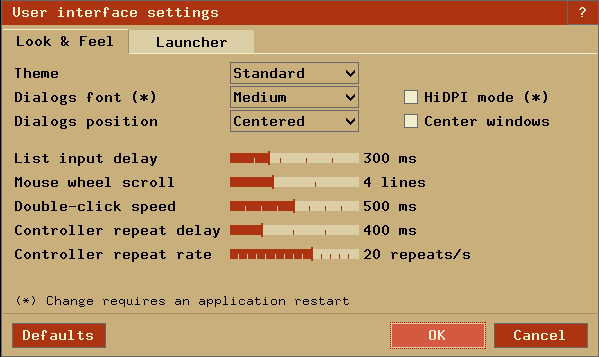 Effective emulation speed displayed as frames per second and user defined emulation speed displayed as percentage relative to normal speed. Cartridge information. If the '*' character is present, it means the bankswitch format was auto-detected as shown. The item in round brackets indicates ROM size. For the given example, the bankswitch type was auto-detected as 4K, and the file size was 4K (4096 bytes). Finally, Stella contains an extensive, built-in debugger. Have a look at this page for integrated debugger documentation. Stella will remember when you change a setting either at the command line or while the emulation is running, and use the settings the next time you start the emulator. The settings are saved in a text file which can be edited outside of Stella. This file can contain your default options, and eliminates the need to specify them on the command line. Any options specified on the command line will override those in the settings file. The syntax for the settings file is very straightforward. Any line starting with a ';' character is considered a comment and is ignored. Other lines must be of the form: command = value, where command is the same as that specified on the command line (without the '-' character), and value is dependent on the command. Stella contains support for Bob Colbert's Cheetah cheat codes, as well as an extended Stella-specific type of cheat code that works on bankswitched ROMs. There's also the concept of one shot codes. These codes work exactly the same as above, except they aren't saved. They are evaluated once and immediately discarded. Stella will require a restart for changes to this file to take effect. The log levels are self-explanatory (None, Basic, Verbose). The "Print to console" option emulates the behaviour of older versions of Stella, whereby the logged output is also shown on the commandline from which Stella was launched (if it was launched in that fashion). Finally, the current contents of the system log can be saved to your home directory by clicking the "Save log to disk" button. Stella uses game properties to specify the "best" emulator settings for a game. As of version 2.2 of Stella, a default database of properties are built-in, but you may modify these through the use of a stella.pro file or within the corresponding Game Properties dialogs. This file will contain all properties modified by the user. So this means that when you upgrade Stella, your personal properties settings are preserved. Every block in the property file must have a unique value for the Cartridge.MD5 property. Cartridge.MD5: Indicates the MD5 checksum of the ROM image as a string of hexadecimal digits. Stella uses this property while attempting to match a game with its block of properties. If the value of the property matches the MD5 checksum of the ROM image then Stella uses that block of properties for the game. You can use the GNU md5sum program, which is included with most Linux distributions, to calculate the MD5 checksum of a ROM image. Cartridge.Manufacturer: Indicates the game's manufacturer. Cartridge.ModelNo: Indicates the manufacturer's model number for the game. Cartridge.Name: Indicates the actual name of the game. When you save snapshots, load/save state files, or use the ROM Audit Mode functionality, this is the name that will be used for the respective file(s). Cartridge.Note: Contains any special notes about playing the game. Cartridge.Rarity: Indicates how rare a cartridge is, based on the scale described on AtariAge. Cartridge.Sound: Indicates if the game should use 1 or 2 channels for sound output. All original Atari 2600 machines supported 1 channel only, but some homebrew games have been written to take advantage of stereo sound mods. The value must be Mono or Stereo. Cartridge.StartBank: Indicates which bank to use for reading the reset vector. Console.TelevisionType: Indicates the default television setting for the game. The value must be Color or BW. Console.LeftDifficulty: Indicates the default difficulty setting for the left player. The value must be A or B.
Console.RightDifficulty: Indicates the default difficulty setting for the right player. The value must be A or B.
Joystick Atari's famous black joystick that was originally included with the system. BoosterGrip A controller add-in that plugs directly into the joystick port and provides a pass-through for the joystick. In doing so, it provides the two independent buttons. Paddles Standard paddle controllers for use with games such as Breakout and Warlords. One pair of controller per connector (allows for 4-player Warlords). Paddles_IAxis Same as Paddles, except the axes are inverted. Paddles_IDir Same as Paddles, except the direction of movement is inverted. Paddles_IAxDr Same as Paddles, except both the axes and direction of movement is inverted. Driving Looks like a paddle, but allows 360' movement. Only one unit per connector, unlike paddles which were sold in pairs. Keyboard Also known as the Star Raiders controller, functionally identical to the Kid's Controller and Keyboard Controller. 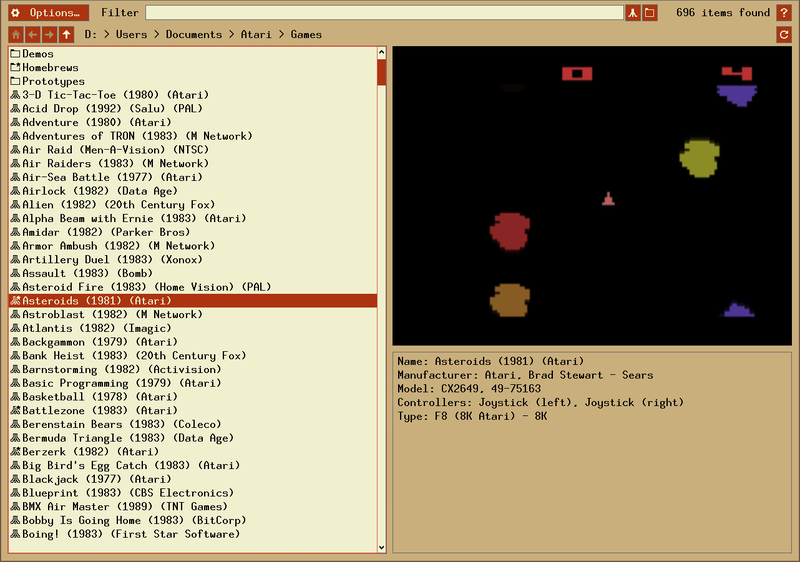 Game included an overlay with commands, for use with Star Raiders. AmigaMouse Commodore Amiga computer mouse. AtariMouse Atari ST computer mouse. Trakball Standard Atari 2600 CX22/CX80 'Trak-Ball' controller. AtariVox A SpeakJet based unlimited-vocabulary speech/sound synthesizer with 32K EEPROM. SaveKey A 32K EEPROM for saving high scores, etc. (the EEPROM portion of an AtariVox). Genesis Sega Genesis controller, which can be used similar to a BoosterGrip, giving an extra button. CompuMate Spectravideo CompuMate (if either left or right is set, CompuMate is used for both). Console.SwapPorts: Indicates that the left and right ports should be swapped internally. This is used for ROMs like 'Raiders of the Lost Ark' where the Player 0 joystick is plugged into the right joystick port. The value must be Yes or No. Controller.SwapPaddles: Indicates that the left and right paddles in a particular port should be swapped. This is used for ROMs like 'Demons to Diamonds' where the default paddle is paddle 1, not paddle 0. Other ROMs such as 'Tac-Scan' default to paddle 3, which can be set using both 'Controller.SwapPaddles' and 'Console.SwapPorts'. The value must be Yes or No. 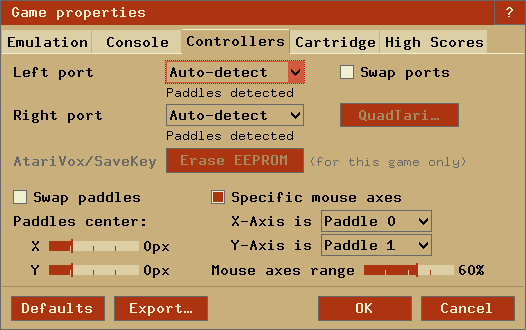 An optional second parameter (default of 100) indicates how much of the paddle range that the mouse should emulate. Display.Format: Indicates the television format the game was designed for. The value must be Auto, NTSC, PAL, SECAM, NTSC50, PAL60 or SECAM60. Display.YStart: Indicates the scan-line to start displaying at. The value must be n such that 0 <= n <= 64. Setting n to zero will enable ystart autodetection, which should work fine for the vast majority of ROMs. Display.Height: Indicates the number of scan-lines to display. The value must be n such that 210 <= n <= 256. Display.Phosphor: Indicates whether the phosphor effect should be emulated or not. The value must be Yes or No. Display.PPBlend: Indicates the amount of blending which will occur while using the phosphor effect. The value must be n such that 0 <= n <= 100. The default value is whatever is specified for tv.phosblend. standard The default palette from Stella 1.4 onwards. z26 The palette from the z26 emulator. user An external palette file, supplied by the user. The palette file must be at least 792 bytes long. Colours are stored in 24-bit RGB, with the first byte for red, the second for green, the third for blue, for a total of 3 bytes per colour. The first 384 bytes of the file (128 * 3) will be used for the NTSC palette. The next 384 bytes (128 * 3) will be for the PAL palette. The next 24 bytes (8 * 3) will be for the SECAM palette, which consists of eight distinct colours. Any extra data in the file will be ignored. The PAL colour-loss effect is calculated within Stella. You do not need to specify those colours in the palette file. Note that to actually use the external palette, the palette file must exist and be valid, and the palette option should be set to user (in Video Settings dialog). The current ROM will have to be reloaded for changes to this file to take effect. Bradford W. Mott started developing Stella during the fall of 1995, and Stephen Anthony has maintained the project since around 2004. Over the years, a number of people from around the world have contributed to the project. Some people have provided technical help while others have offered suggestions and praise. The Stella Team is grateful for all the help and support it has received over the years. A (likely incomplete) list of the people who have played a part in bringing Stella to you is available on the main Stella webpage Credits List. If we've missed someone, please let us know.